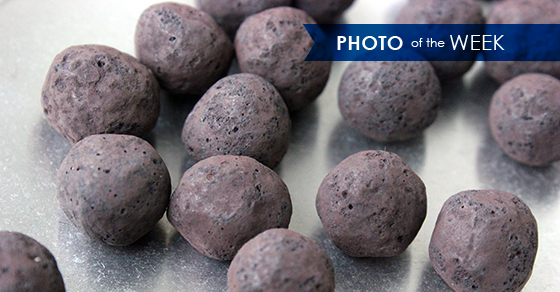 This week’s photo shows iron ore pellets. FEECO offers extensive iron ore agglomeration services, including material testing in our renowned Innovation Center, as well as custom processing equipment. Data gathered during agglomeration test work at FEECO can then be used for process scale-up and design of a full-scale production plant. Balling drums. An ideal solution for high capacity applications, balling drums work by tumbling material and binder in a rotating drum to create pellets..
Pug mills (paddle mixers). Pug mills are often used for processing steel by-products in the form of dust and scale to liberate iron ore. In addition to the equipment above, FEECO also manufactures rotary dryers and material handling equipment, including belt conveyors, bucket elevators, steep incline conveyors, and reversing shuttle conveyors for iron ore. Contact us today and learn more about FEECO’s decades of experience in iron ore agglomeration.